To get an idea of the technical challenges of dispensing solder paste, imagine a bucket filled with equal parts of water and sand. If you swing the bucket from side to side you’ll notice that the water moves in one direction, the sand in the opposite direction. The sand, heavier than water, can’t keep up. Solder paste behaves the same way. When pressure is applied to solder paste inside a syringe, the flux moves first, pushing the particles along as it goes. No matter what dispensing method you choose, be sure that the flux vehicle continues to transport the alloy. You don’t want the flux to move faster than the alloy, leaving the metal behind. If that happens, engineers can expect clogs, inconsistent solder deposits, and bad solder joints. Assemblers have several options for dispensing solder paste. 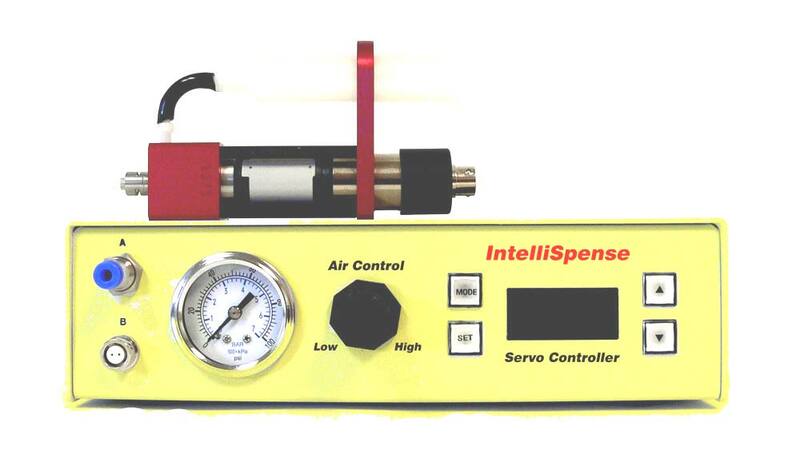 Pneumatic dispensers use controlled pulses of pressurized air to dispense paste from a syringe. Simple, inexpensive and fast, these systems can be handheld or mounted to a dispensing robot. They are typically used forlarge deposits—dots 0.03 inch in diameter or larger. If you need fairly substantial solder deposits, the basic pneumatic shot meter with a 10cc/ml syringe is fine. However, time-pressure systems are not as accurate as other dispensing methods, and they can be more stressful to the paste. Because each pulse of air affects all the paste in the syringe, the size of the reservoir that can be effectively used with time-pressure systems is limited. Variability from deposit to deposit can be as high as 10 percent. Another problem is paste flow after pressure has been shut off. A material filled with a heavy metal is hard to stop once it starts moving. For paste deposits smaller than 0.03 inch in diameter, an auger valve is most commonly used. An auger valve consists of an Archimedes screw powered by an electric motor. The performance of the valve can be adjusted by varying the speed of the screw, and the pitch and depth of its threads. Paste is fed to the screw from a syringe under a constant low pressure. With a time-pressure dispenser, the air pressure is typically 30 PSI, but with an auger valve, it’s approximately 8 PSI—just enough to feed the auger but not enough to have any negative effect on the paste, so you can use large reservoirs with auger valves. Auger valves can make sub-milligram deposits with less than 5 percent variability from deposit to deposit. Augers, a good choice for solder paste, put less shear load on the material. Besides the dispenser, assemblers also must consider the equipment to which the dispenser is mounted. The dispenser should be isolated from sources of heat and vibration, such as reflow ovens and feeder bowls. Heat can reduce the viscosity of the paste, causing inconsistent deposits. Vibration can cause the material to separate. If the dispenser is mounted to a Cartesian robot, the system should be programmed to make slow starts and stops. Servo driven tables are best for solder paste dispensing. If the paste is mounted on the Z axis, it could get shaken pretty hard, causing the flux to separate from the metal. You’re not going to be able to dispense 40,000 dots per hour with solder paste. The material won’t stay in suspension. To lessen the risk of paste separation during automated dispensing, assemblers should choose syringe size carefully. Assemblers must weigh the frequency of replacing the cartridge against the material’s sensitivity to heat and vibration. A small cartridge might have to be replaced more often, but less will be wasted if the paste separates because of excessive vibration. Tips for solder paste vary, depending on the dot size and the dispenser. Tapered Tips allow sighting fluid level at all times and feature safe, semi-transparent, non-scratching, all-plastic construction and UV Blocking Agent for any material including most light sensitive adhesives. 1 1/4" in length, they are rigid. Thin Wall Disposable Precision Tips feature a lower cost replaceable drawn metal core, which snaps into a reusable stainless hub and snaps out for quick changeover, cleaning or changing gauge sizes. 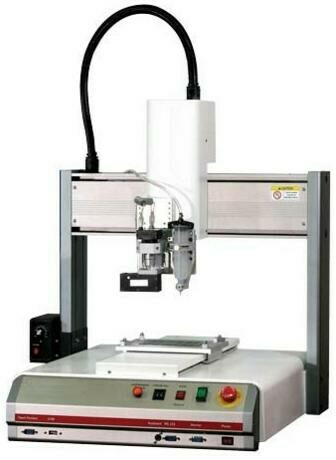 Use in dispensing on robots or where application, hand held or robotic, calls for close tolerance. With valve dispensing, you want very good positional accuracy, and stainless steel tips provide that, but whether the tip is plastic or steel, assemblers should choose the shortest possible tip with the widest possible inside diameter. A tip that is too restrictive will produce excessive back-pressure on the paste and foster tip clogging. Assemblers should not expect to produce a deposit with a diameter smaller than 1.5 times the inside diameter of the tip.